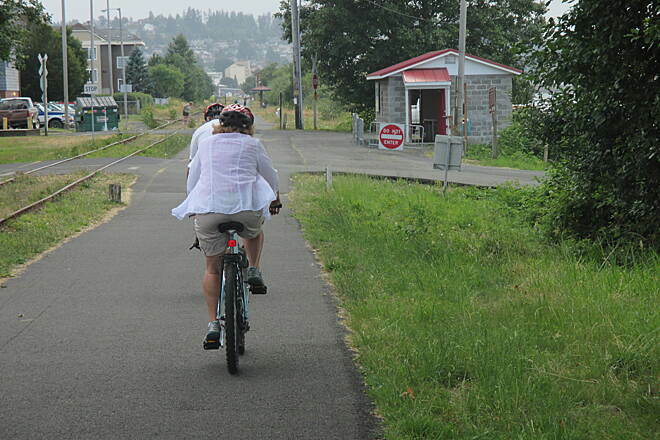 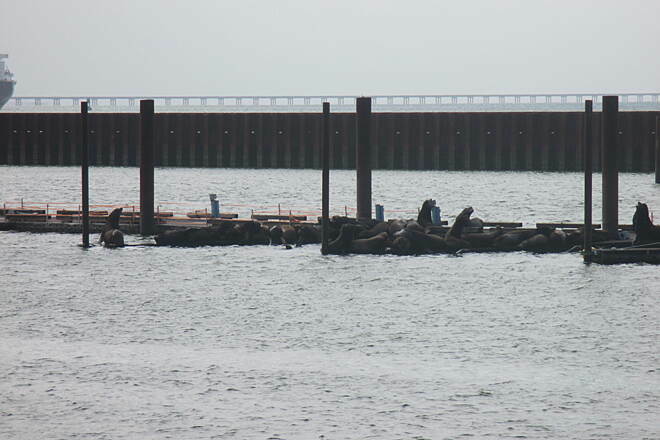 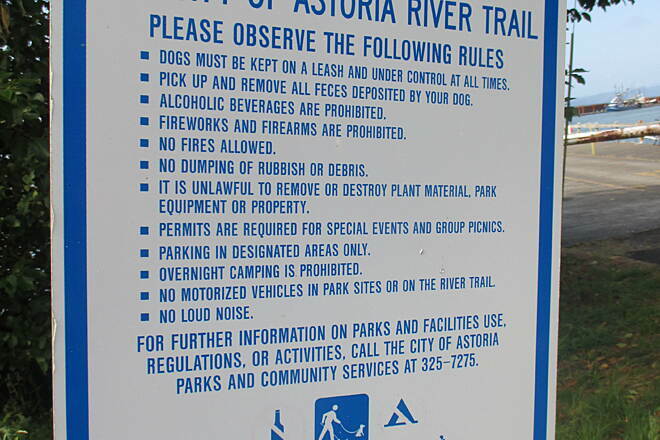 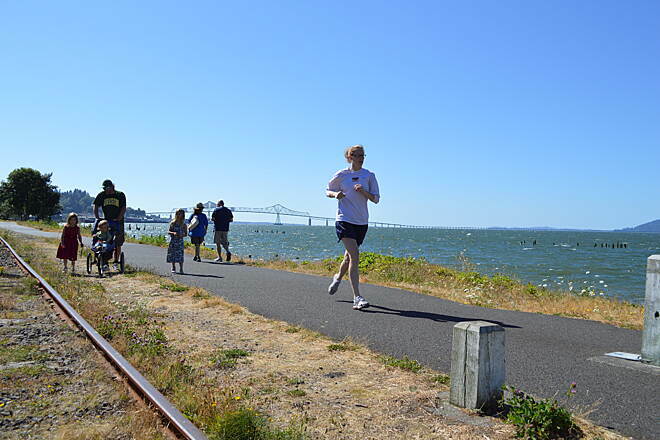 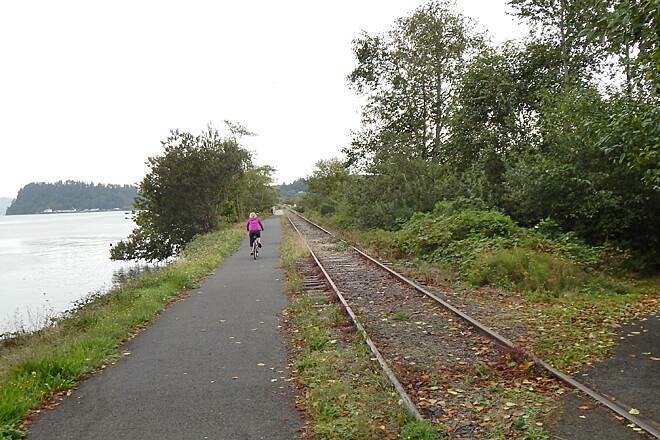 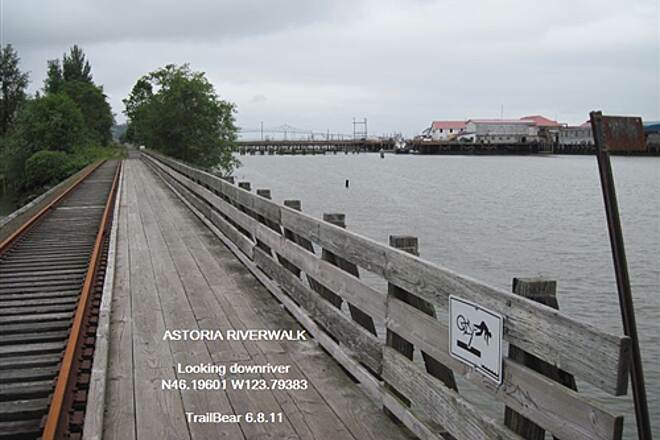 a nice quiet stretch along the Columbia River at the east end of the Astoria Riverwalk path. 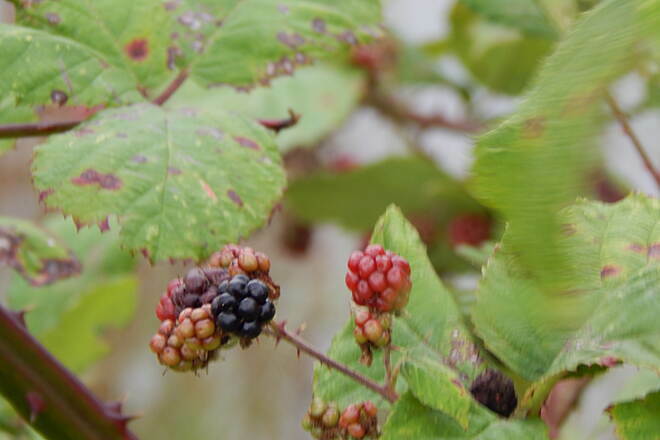 Blackberries ripening up for lucky users of the trail! 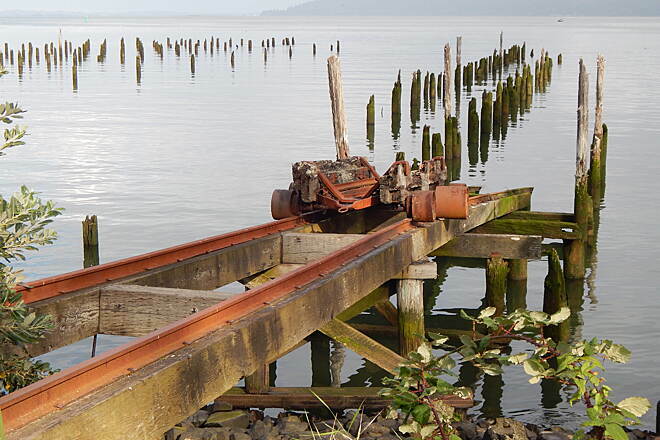 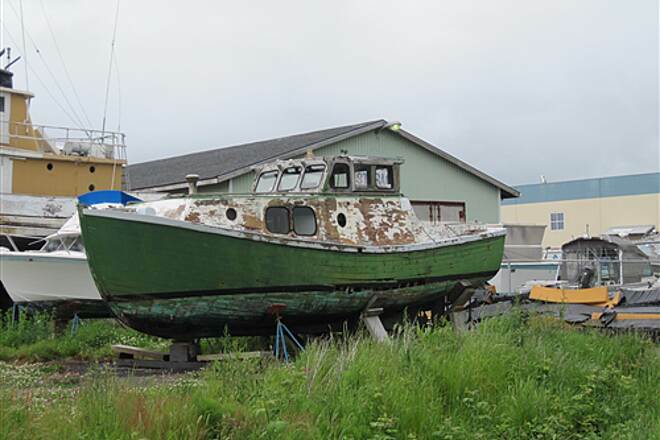 Evidence of the old cannery history. 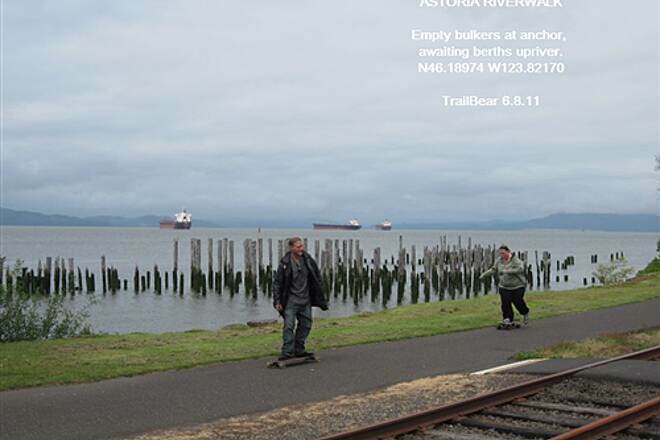 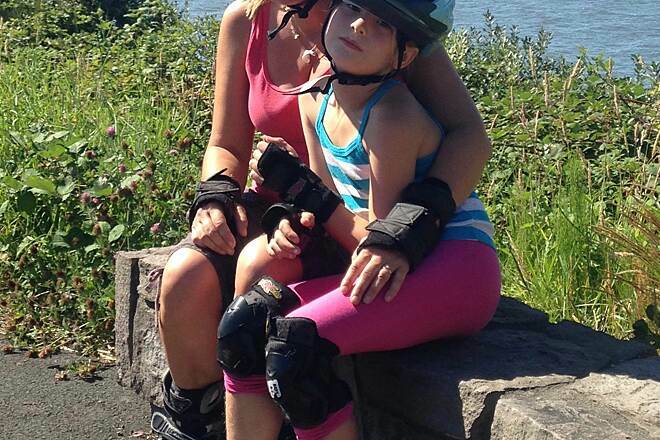 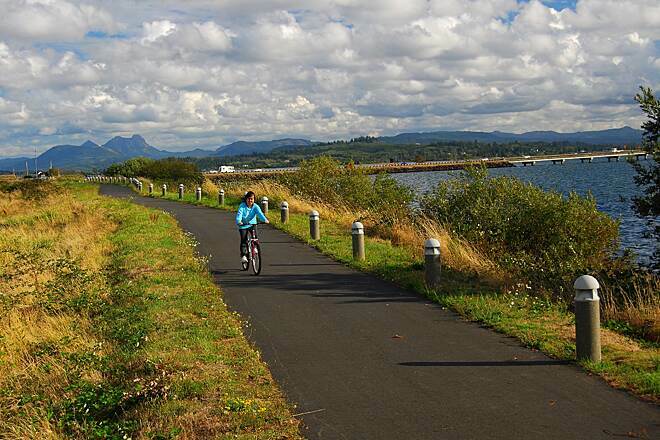 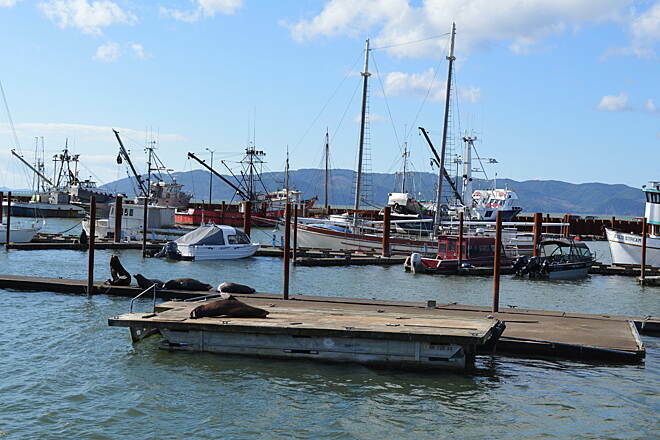 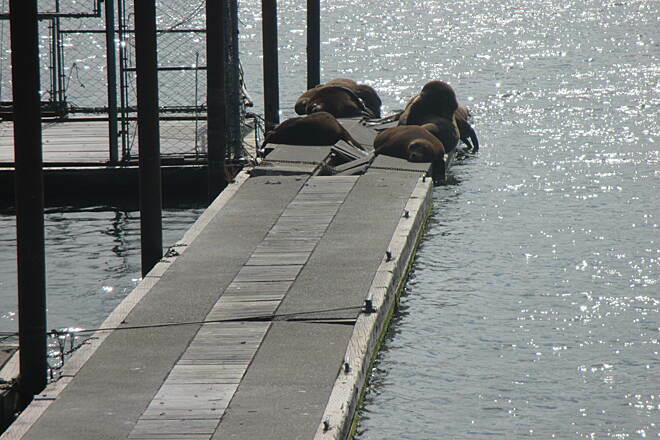 a Beautiful scene along the Astoria Riverwalk and the Columbia River. 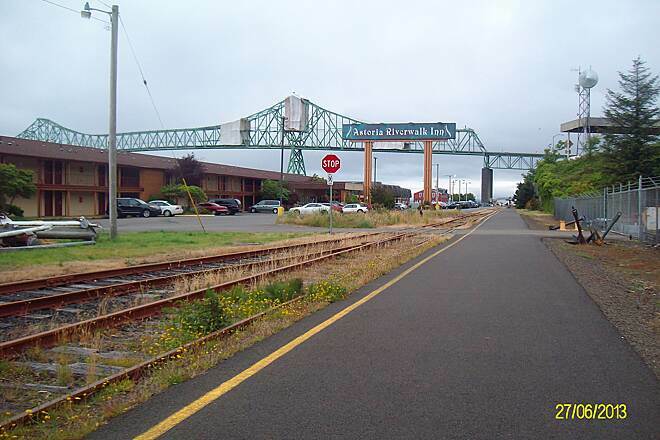 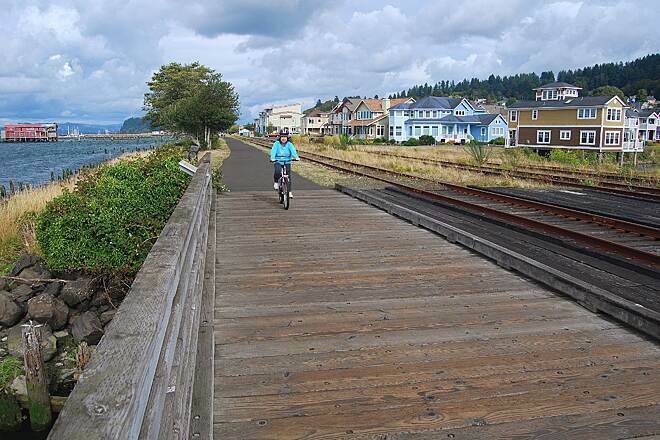 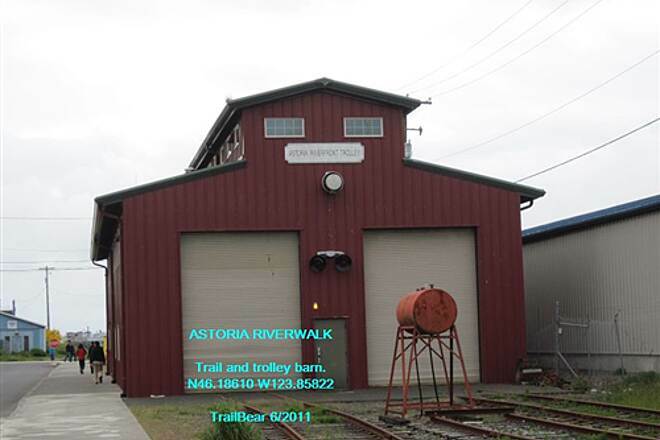 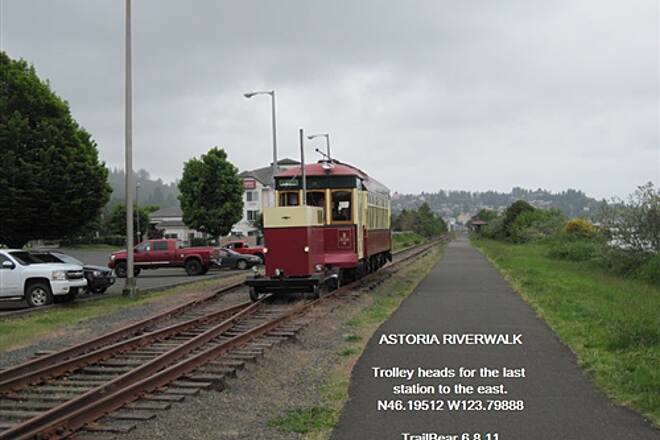 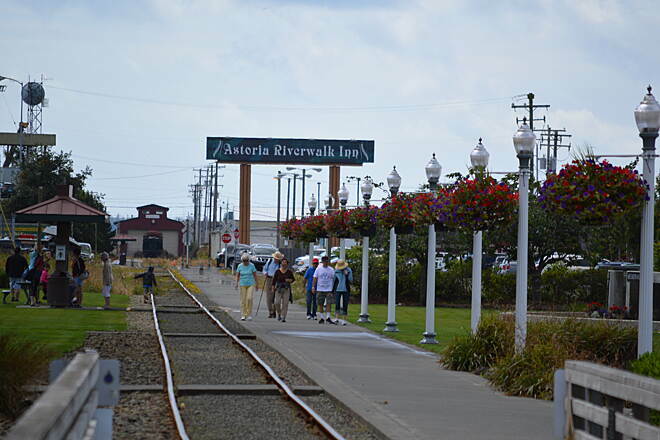 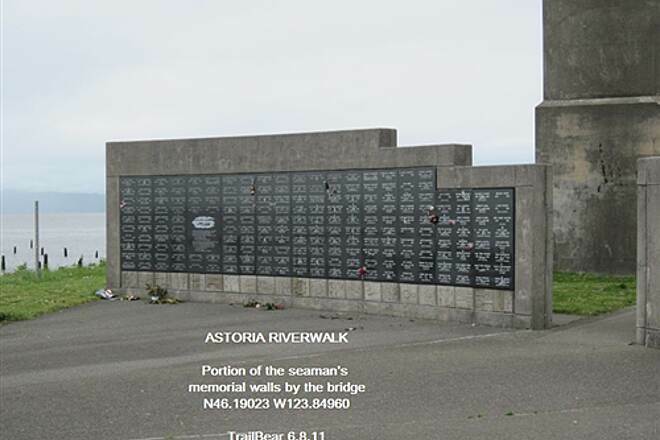 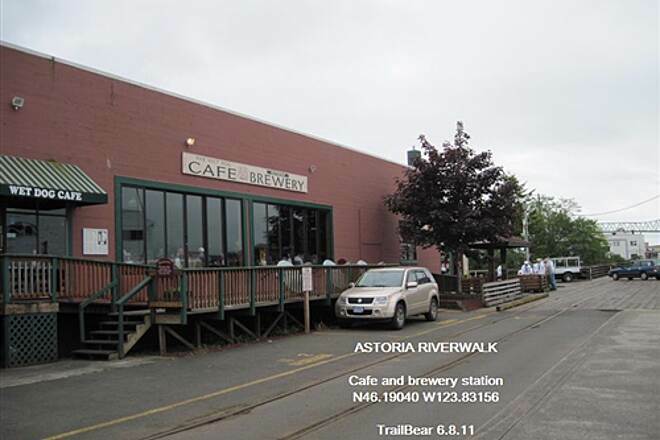 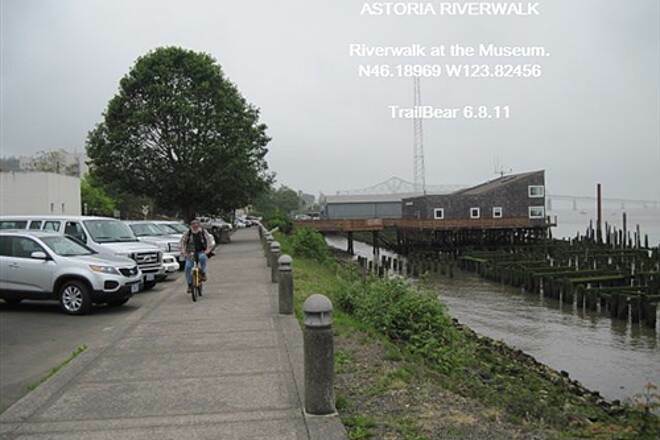 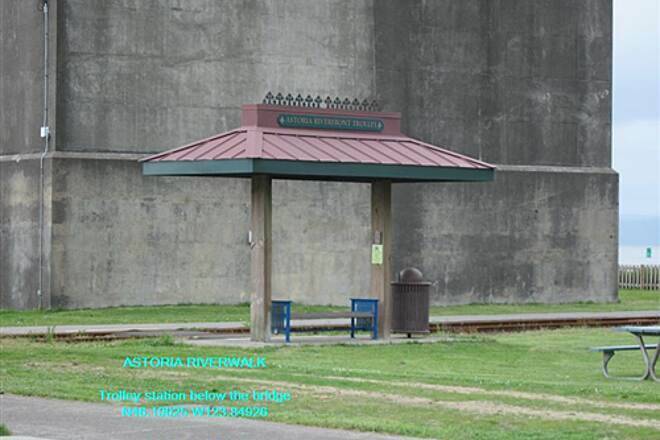 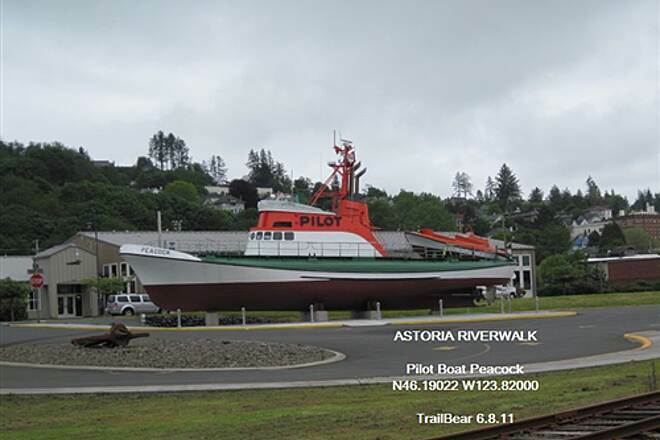 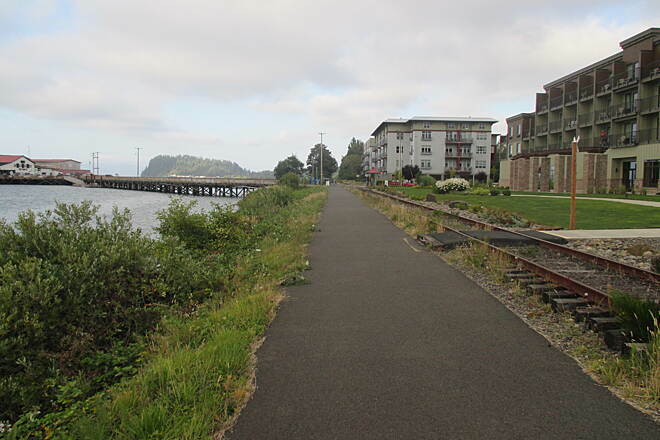 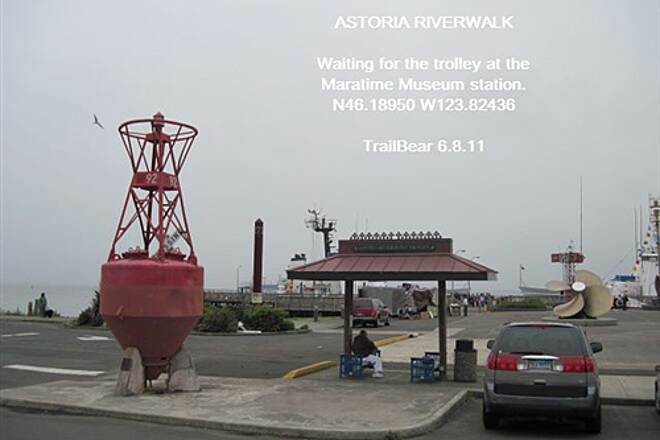 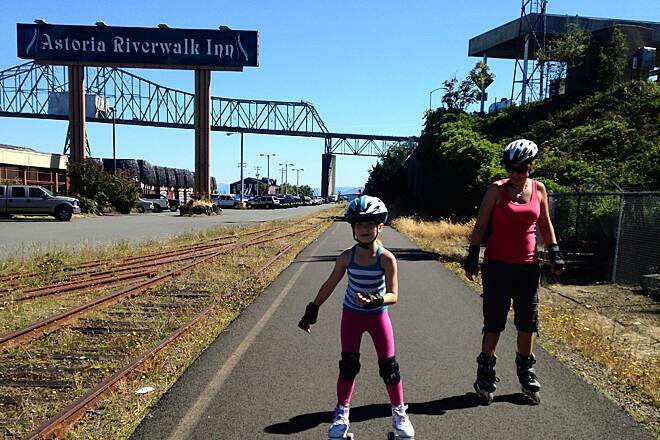 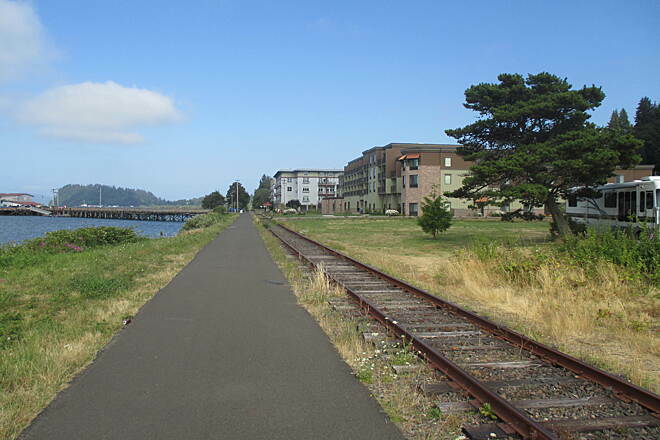 The very west end of the Riverwalk trail in Astoria. 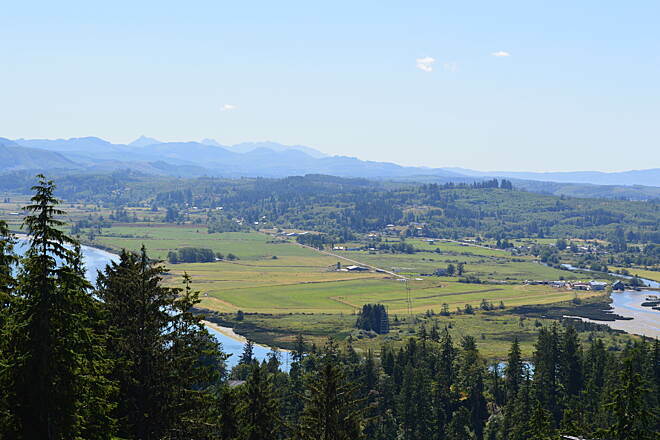 Saddle Mountain in the background and the water is Youngs Bay. 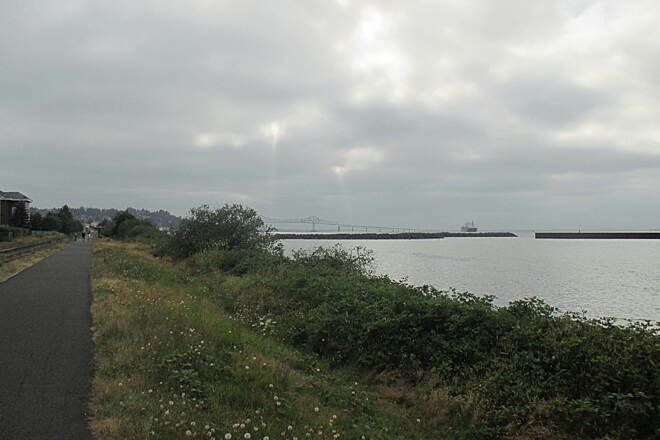 Ships pointed up river awaiting the Columbia River Pilot. 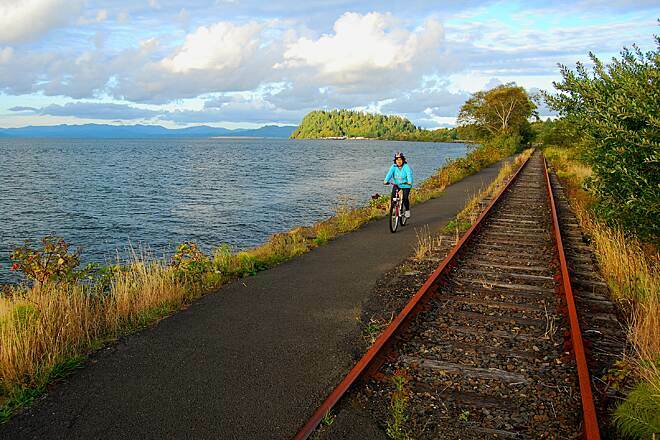 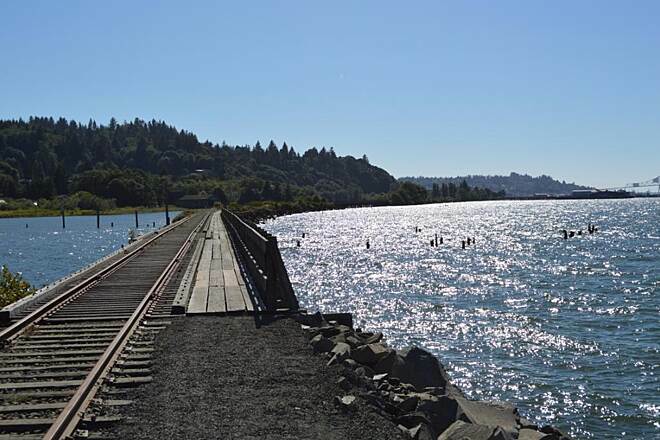 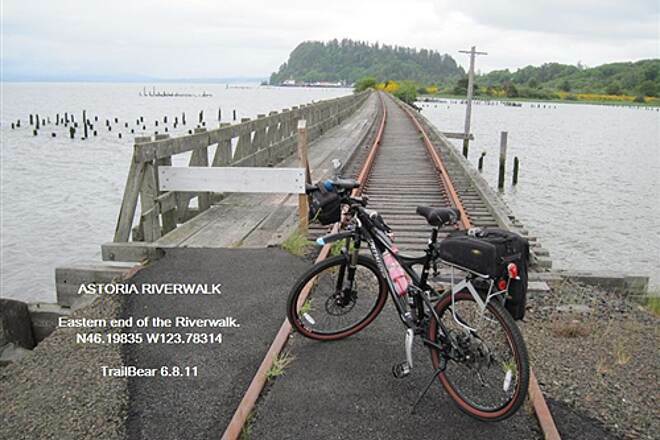 The trail passes under the Astoria-Megler Bridge, the largest truss bridge in the world, arcing out across the Columbia River toward the hazy hillsides of Washington State. 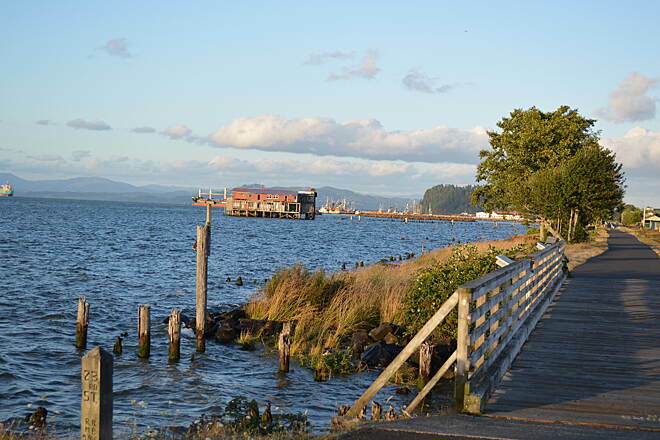 In the 1940s, at the peak of the city’s prominence as a salmon and tuna processing hub, canneries lined the waterfront. 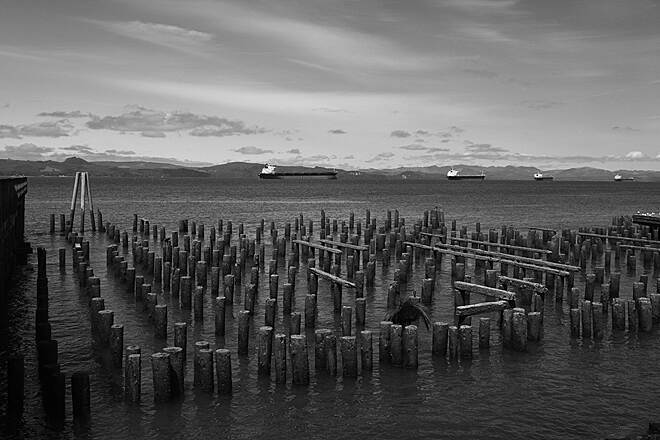 Lingering remnants from that time are the thousands of wooden pilings that bristle up from the water. 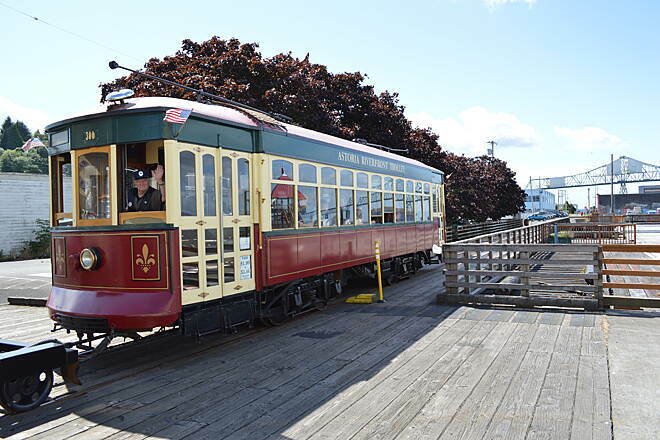 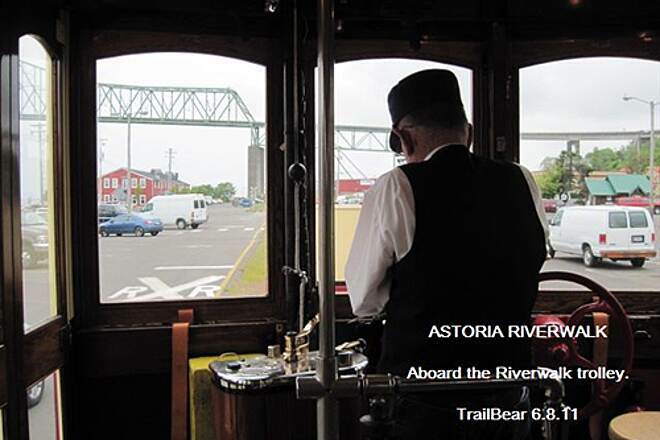 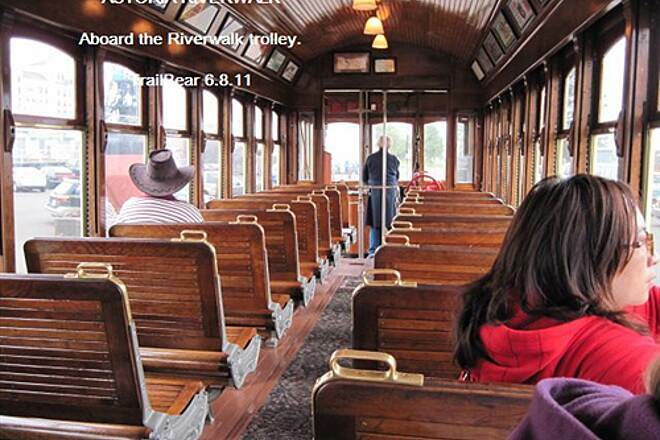 You’ll get a little history lesson on the trolley from the volunteer conductors. 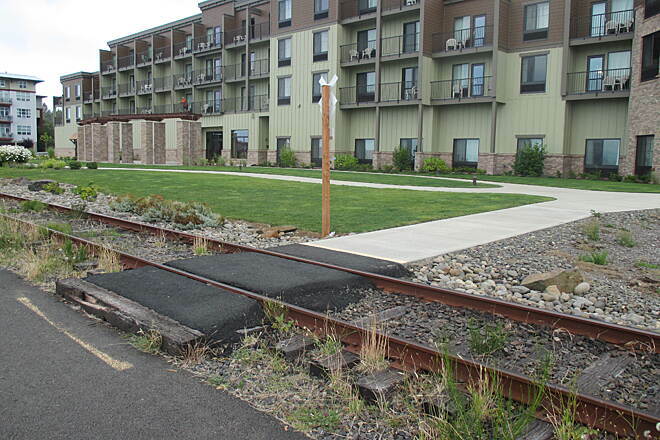 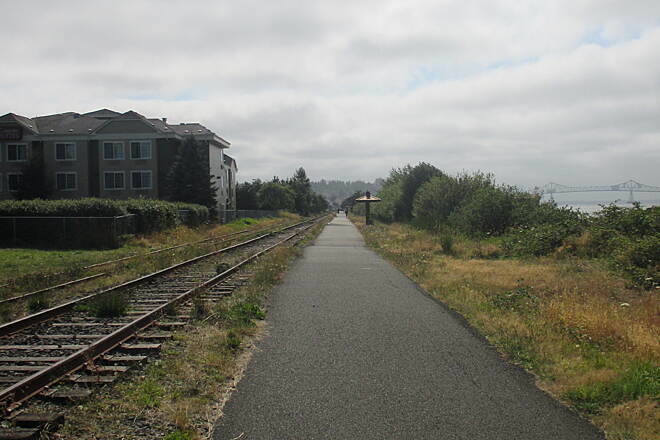 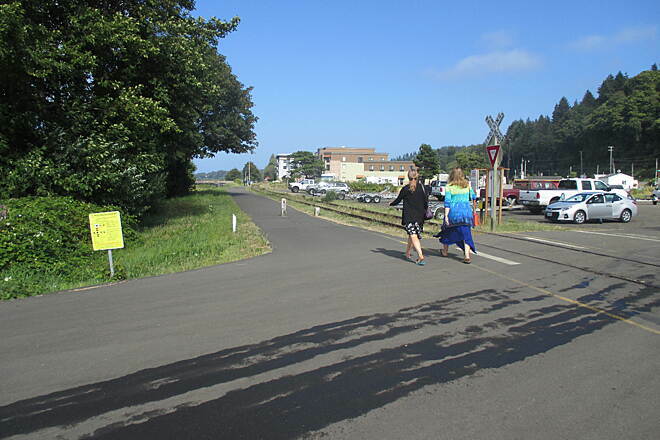 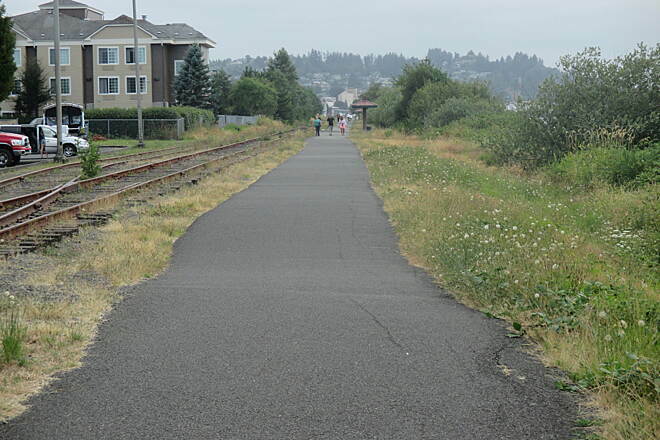 It runs only as far as 39th Street, but the trail and tracks continue another half mile until you reach the turnaround near Tongue Point. 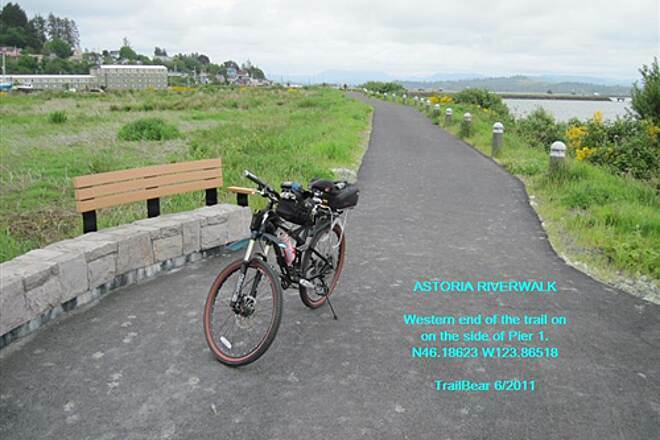 End of the ride - west trail end. 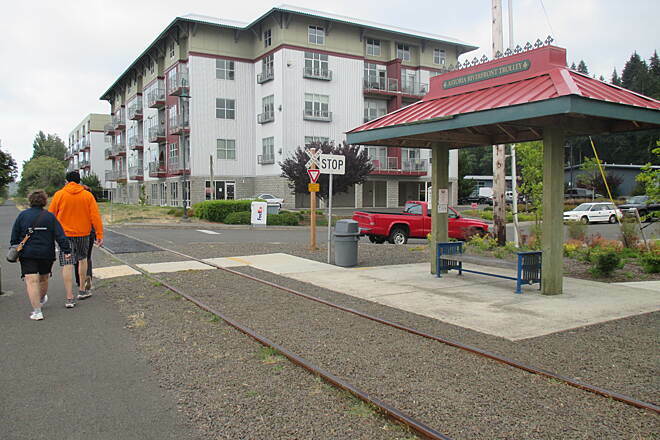 Parking lot over towards motel. 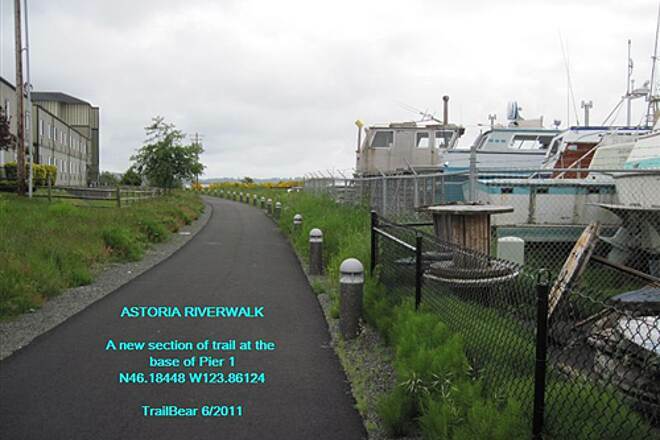 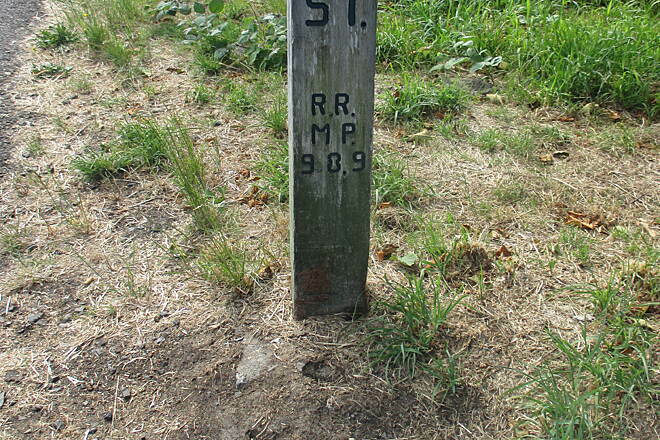 Eastern end of the trail. 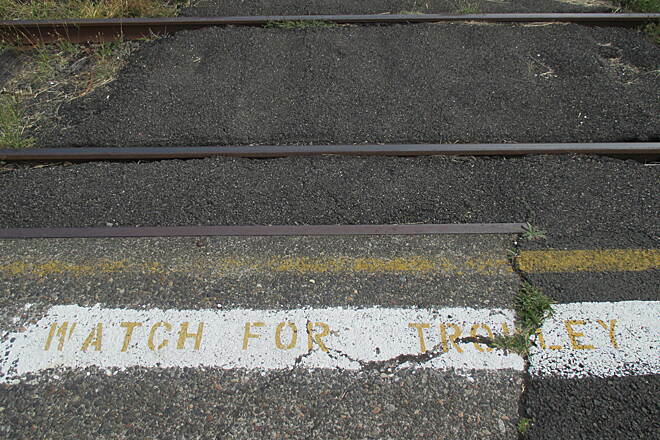 Sewage lagoons ahead. 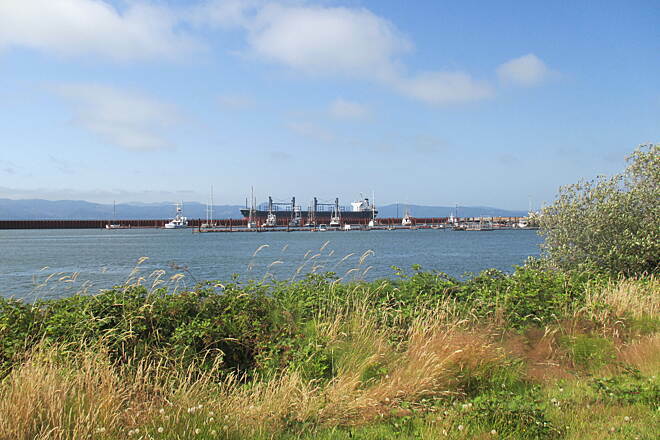 Ships at anchor, awaiting berths in Portland. 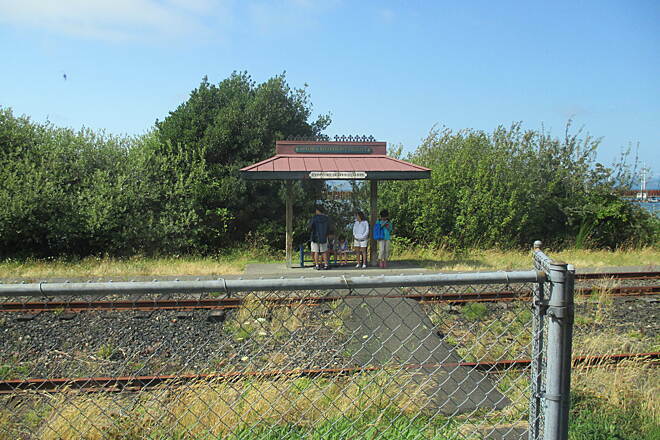 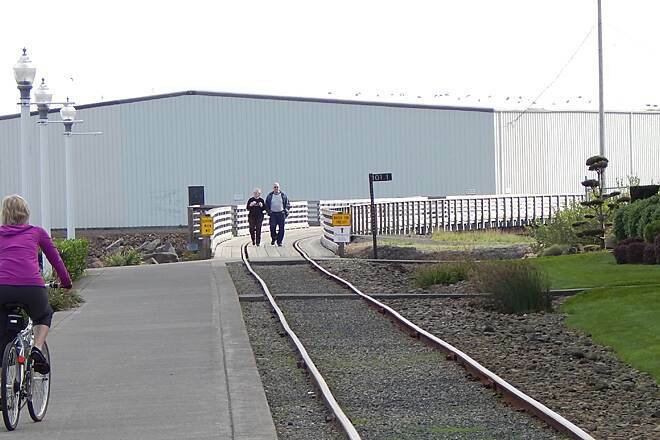 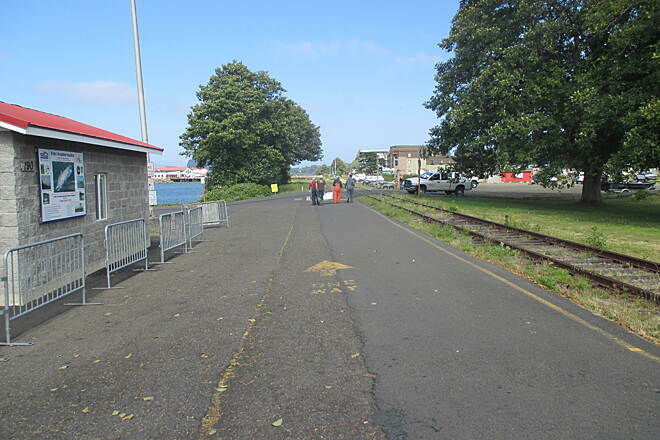 The trail at the Maritime Museum looking seaward.